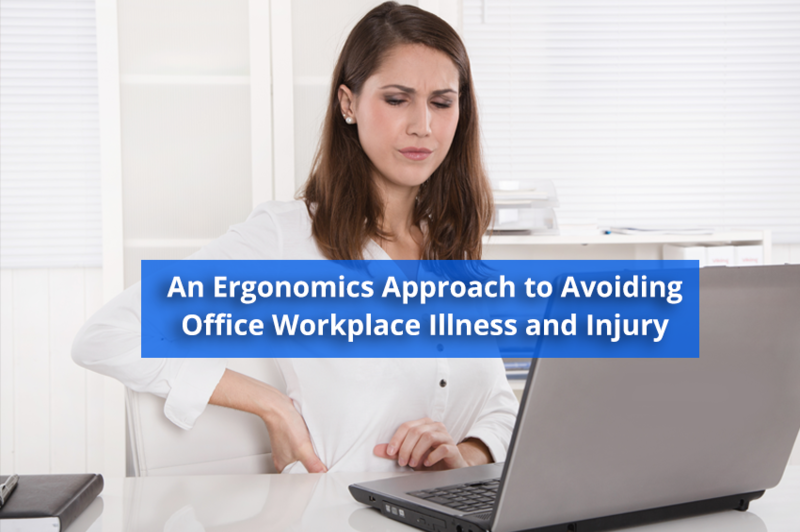 An Ergonomics Approach to Avoiding Office Workplace Illness and Injury - Solutions Northwest, Inc. Workplace injuries cost a lot of time and money, but did you know that 33% of those injuries are musculoskeletal disorders, like carpal tunnel and back strains? While you can’t prevent every injury, you can lower the prevalence in your company. Creating an ergonomic workplace can reduce work-related musculoskeletal disorders while leaving your workers happier and more productive. In short, ergonomics is the process of creating an environment that increases productivity and reduces the risk of musculoskeletal disorders (MSDs). MSDs affect muscles, nerves, tendons, and joints. They occur or are worsened due to repeated movements or stress on the body. For example, employees who demonstrate bad posture all day may end up with muscle strains resulting in back or neck pain. Not only may they need to take time off work, but they may also be less productive at work because they’re in pain. However, by designing an ergonomic workplace, you could help your employees reduce their risk for developing MSDs keeping them happy, healthy, and productive. Now that you know what ergonomics is, let’s talk about how you can use it in your office. If you’ve ever sat in an uncomfortable chair, you’ll know how it can quickly get uncomfortable and even painful. To avoid this in your company, invest in quality chairs for your employees. These should have adjustable armrests, height, and lumbar support, so your employees can find the right setting for them. The backs of the chairs should also keep that natural “S” shape to fully support the spine, and the angle between the seat and backrest should allow you to comfortably sit up straight without pushing your forward. When you bring new employees on, consider showing them how to adjust the different features of their chair and offer information on the importance of good posture at work. While investing in good chairs is a big step, it’s not the only thing that has to be done to create an ergonomic work environment. You can further prevent against back, neck, and wrist strains by offering additional ergonomic solutions for those who need it. For example, your employees’ feet should always touch the ground when they sit. You can offer footrests to your shorter employees to help them improve their posture and stay comfortable at work. Keyboard wrist rests are also a great idea. They take the weight off your wrists and offer support to prevent strains. Don’t let your employees suffer MSDs on your watch. Ergonomics consultants have studied this topic robustly, it may be wise to invest in an ergonomics assessment for your workplace to see a difference in the productivity and health of your employees. In the same way you must invest in proper equipment, you or your office manager should invest in a proper ergonomics assessment. An ergonomics expert will see what you couldn’t see, as well as offer custom plans for your workplace. In the long run, this investment will pay off as you will see higher productivity and less injury in your workplace. If you don’t invest in the safety of your workers, you will lose money in the long run. If you’re seeking out ergonomics solutions to your office work place, you’ve already taken the first step. For more guidance on all work related health and safety issues, visit SolutionsNW.com or Contact Us for more information.